How many business owners can truly say they love what they do and feel like their businesses make a difference in the world? While, by trade, Rick is a lawyer and Ellen is a teacher, working with children both in our and swim school and camps is our real passion. Seeing our caring, professional and kid-focused staff making a huge positive impact in the lives of our swimmers and campers is incredibly gratifying. It is hard to believe that Zodiac Swim School has been helping kids and adults learn in and love the water since 1978! Zodiac was a dream of Ellen’s that she made a reality in high school. 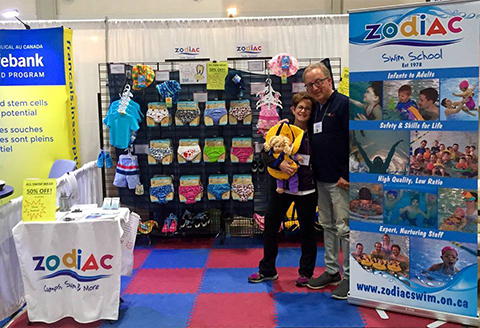 While Zodiac is one of the leading, professional swim schools in Canada, its focus on individualized attention and high-quality, low-ratio programs has never wavered. We are so pleased by and appreciative of the positive feedback about our awesome teachers and the great experiences they are providing for our students! We are also delighted that families swim with us on a year-round basis and anxiously await their opportunity to secure their spots…the loyalty of Zodiac families and our commitment and obligation to them is something we take very seriously. Our love of working with kids in aquatics and passion for and background in camping led to the creation of Zodiac Day Camp in 1998. Our goal was (and still is) to provide campers with a unique, nurturing, specialized program. While younger campers enjoy a variety-based program, older campers get to experience our unique specialty program in which Zodiac swimming is a centerpiece of every camper’s day. Our Zodiactors’ extra-curricular theatre program grew out of the success of our Performing Arts program at Zodiac Day Camp and our long-time friendship and working relationship with Angela Williams/Groove. We love helping kids enjoy theatre, participate in a mini-Broadway show and build their self-confidence! Many Zodiac families also enjoy an amazing experience at our beautiful Muskoka overnight camp, Camp Tamarack. With a large number of children participating in weekend introductory experiences at Tamarack and others becoming full-fledged campers at Tamarack for long or short sessions, we are excited to have another unparalleled experience that Zodiac families can enjoy for years to come. Swimming, camp programs and so much more…we love helping children (and adults!) develop skills, build self-confidence and make memories to last a lifetime. The confidence that Zodiac families demonstrate in us is never taken for granted and appreciated more than it is possible to express. We are parents of three amazing kids and plan for, care about and treat other people’s children as an extended part of our family. Some people wonder how we do what we do, how we sleep at night, etc. The answer is that we work and plan and hire an amazing team of people who make our dream a reality. We truly love what we do.